It's no secret that Amsterdam has an over-tourism problem. Dam Square is thick with tourists and pickpockets, and the Red Light District (properly known as De Wallen) has become an adult Disneyland where stag parties run wild. Arre Zuurmond, a city official in Amsterdam, has called the center an “urban jungle” at night. This past fall, Amsterdam’s new city council voted to remove the iconic “I Amsterdam” sign from its prime spot in front of the popular Rijksmuseum as a highly visible first step in its efforts to combat mass tourism. Huge crowds gathered daily at the sign, taking an estimated 6,000 selfies per day. The sign was removed in early December. In 2018 alone, Amsterdam saw 18 million tourists—a huge number for a city with less than 900,000 residents. And unfortunately for Amsterdam locals, many of these tourists view the city’s legal prostitution and lenient marijuana laws as cues that the city is open to anything. The city’s tourism marketing office launched an “Enjoy and Respect” campaign this spring targeting Dutch and British tourists aged 18 to 34. The campaign highlights the high fines for common tourist misdeeds, ranging from littering to peeing on the street. But all is not lost for visitors to Amsterdam. In the city’s outlying neighborhoods, there’s plenty to experience away from the central crowds. Amsterdam East, for example, is just a 15-minute bike ride from Dam Square. When I moved there from Canada a year ago, I found a community completely unlike the harried Amsterdam I’d experienced on vacations in the city. In this neighborhood, life moves at a quieter pace and shopkeepers don’t switch to English as soon as they hear my highly imperfect Dutch. It’s a place where locals live, work, and play. Yes, Heineken is the largest Dutch beer company, and their former brewery (now the Heineken Experience) is more than 150-years-old. But you can buy Heineken anywhere, and let’s be honest: big-name beer is out. While you’re in Amsterdam, why not explore the thriving craft beer scene and try some local and Belgian-inspired brews you can’t buy back home? Brouwerij ‘t IJ makes the city’s most famous craft beer in a stunning location at the base of De Gooyer windmill. The beer is in such high demand that much of it is now brewed offsite, but the original brewery still produces all the beer for the taproom. Brewery tours run Friday through Sunday at 3:30 p.m.
Poesiat & Kater, housed in a former gasworks building from 1887, has two lines of craft beers. The Poesiat & Kater brews are modern creations, while the Van Vollenhoven line is based on centuries-old recipes. Guided tours run Saturdays at 3 p.m. I can’t lie: Vondelpark is lovely and worth a visit. But to truly enjoy a quiet picnic and iconic view, you can’t beat Flevopark in Amsterdam East. 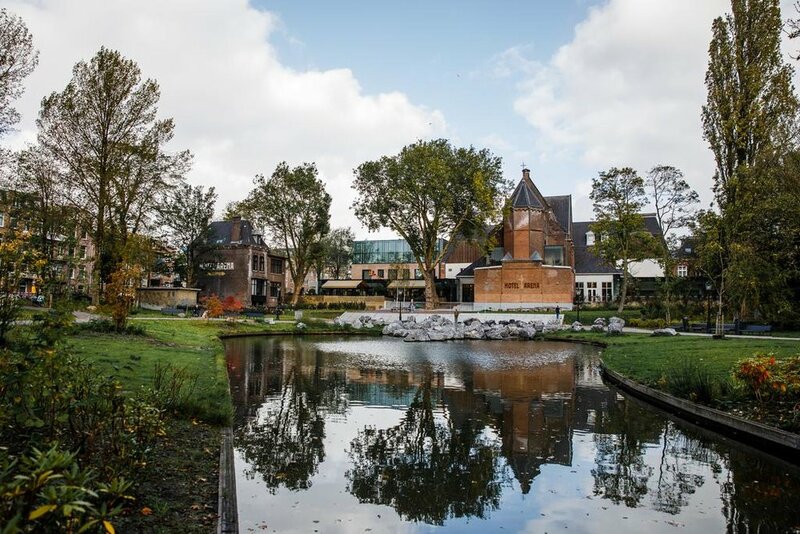 The park runs along the IJ river, and includes two quiet lakes, grazing sheep, and even a jenever distillery. It’s especially beautiful at sunset, when the Dutch light filters through the trees. If you’re into architecture, you can’t miss Frankendael Park. Originally a grand country estate, the seventeenth-century house and formal garden still remain in impressive condition. There’s also a landscape garden that showcases plants from across the Netherlands. At dusk, head to Oosterpark and look up—you’ll spot hundreds of wild green parakeets in the trees. Descendants of birds that escaped from Artis zoo, they’re actually a bit of a problem as an invasive species, but for visitors they’re an unexpected delight. Beer bikes have been banned in the center of Amsterdam since 2017, when they were deemed a public nuisance. But you’ll still see them in the outer neighborhoods, including Amsterdam East. These rolling bars are incredibly obnoxious in a city that’s all about bike culture. They clog roads and bike lanes, which is a real problem during commuting hours. And you’re fooling yourself if you think this is biking. They’re mainly engine powered—you don’t even have to pedal. the East neighborhood of Indische Buurt, then through Flevopark, along a dike, and past an old defensive fort. The ride to Muiderslot Castle takes less than an hour from Centraal Station—but allow extra time for photos along the way in spring, when the fields are filled with frolicking lambs and baby goats. Originally built in 1370, Muiderslot Castle is the best-preserved medieval castle in the Netherlands. Inside, you can visit the medieval towers, explore the residence on a guided tour, and learn about birds of prey from the onsite falconer. Amsterdam banned new hotel developments in the city center back in 2000 to try to limit the number of tourists packed into the popular canal belt area. Staying in Amsterdam East gives you a chance to immerse yourself in neighborhood life without contributing to the frustrations of central residents who have to fight through crowds of tourists just to get out of their homes. Hotels in Amsterdam East tend to be less expensive than those in the center, and you can stay in some really interesting converted old buildings. The Manor Hotel is located in a former hospital, the Arena Hotel is a former Catholic orphanage, and the Generator Hostel is in the former zoological department of the University of Amsterdam—where the old science lecture hall now serves as a unique bar. Amsterdam East is not immune from the pressures of over-tourism or the gentrification that comes with it. But even at the peak of summer, when Rembrandtplein is so packed that you can hardly see The Night Watch, there’s plenty of open space to check out the public art in Oosterpark, and room on Javaplein’s terraces to enjoy a coffee or a beer in the sun. From Meatless Mondays in schools to Amazon employees pushing for corporate action on climate change, these five green movements spark hope for a better future. Trend Alert: “Rescued” Food Is All The Rage. Here Are the Best Ones. A roundup of the best upcycled foods products, from vodka to chocolate chip cookies. Christina Newberry is an award-winning Canadian freelance writer now living in Amsterdam, where she’s learning to speak Dutch and navigate bike lanes. Her work has recently appeared in Canadian Traveller, Roads & Kingdoms, Time Out, and Fodor’s.